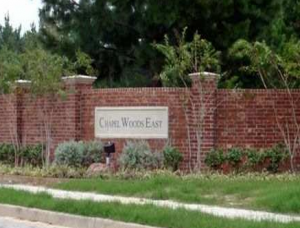 Chapel Woods East is a wonderful community in Tyler, Texas. This suburban area has a small town feel that many residents enjoy. Due to its location, people here have access to all of the amenities offered in the city of Tyler. This community has everything a family could need, including great parks, an excellent school district, and many attractions close by. Chapel Woods East is home to numerous golf courses. One can find the perfect one to match any level of play, including putt-putt. Avid golfers will want to visit Hollytree Country Club, Eagles Bluff, Cascades Golf Club, or Willow Brook Country Club. Those who love to shop will enjoy the many options nearby. The Broadway Square Mall is a terrific spot for families. With over 90 stores and adjacent restaurants, this is a great place to spend some time browsing. The South Broadway Avenue Shopping Corridor is the main strip for stores of all types, while shopping centers such as Bergfeld Center and Broadway Center are perfect for running errands. Chapel Woods East is fortunate enough to be located within three school districts; Tyler Independent School District, Chapel Hill Independent School District, and White House Independent School District. This allows children to have access to top rated schools, both public and private. History buffs will find many historical sites and museums close by Chapel Woods East. The 1859 Goodman – Legrand Home and Museum is a Tyler Texas landmark. The best part is that visitors are welcome to come and explore the antiques free of charge. The American Freedom Museum is 15,000 square feet devoted to telling the story of our country’s beginnings. The Ballet Tyler is fun to watch or participate in. Made up of local dancers ranging in age from 11 to 20, they hold several performances throughout the year. People of all ages enjoy the Caldwell Zoo. Over 2,000 animals are on display in the many exhibits. These include and aquarium and petting zoo. Residents of Chapel Woods East have access to Faulkner Park. Here one will find tennis courts, a fish pond, baseball fields, and picnic areas. In addition, they offer nature and hiking trails. Tyler State Park is much larger. Located two miles North of Chapel Woods East, it comprises 985 acres of beautiful rolling hills and a 64-acre lake. Mountain biking, paddleboats, and kayaking is just a sample of the activities available. Chapel Woods East is the ideal home for those who love the outdoors. Rose Rudman Recreational Trail is perfect for short walks or longer hikes. It is open to walkers, joggers, bicyclists, and even roller blades. For the more adventuresome, Adrenaline Rush Zip Line boasts Texas’s longest ride at 1,700 feet. Lake Tyler and adjacent Lake Tyler East covers 5,000 acres together. Tyler’s main water supply, it serves double duty as a recreational spot. People come to enjoy boating, fishing, water skiing, hiking, and camping.